Imagine giving your child the world… not materially, but teaching him or her about other people and places, and imparting the gift of a global view. 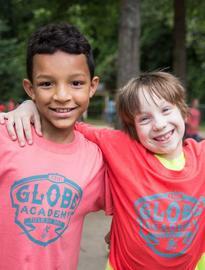 That dream is a reality at The GLOBE Academy, where students learn 50% of their academics in English and 50% in a second world language (Spanish, French, or Mandarin). Language is one of the strongest components of culture and is therefore a window into the thoughts, beliefs, and mindsets of others. Besides mastering a second language, immersion students are more aware of—and show more positive attitudes towards—other people and cultures. The GLOBE Academy embraces diversity and supports students and families from different cultural and linguistic backgrounds, nationalities and socio-economic levels. As your child begins to learn about other people, places, and ways of doing and being, it gives him or her a starting point for understanding differences of all kinds. Through small steps taken now, we will help teach your child the skills needed to be comfortable and confident in the world.